Honesty is often considered as a moral virtue inspired by integrity. It is rarelly found in contemporary society, especially among individuals and even religious leaders who do not truly place premium in adhering to the angelic attribute of piety. It is generally believed that in today’s world, a reasonable number of people from all works of life are not to be trusted. Many have chosen the path of disonesty as the only way to make a living. The 29th March of this year was a special day in the life of one Bashir Usman, a Jos tricycle driver who was rewarded with items and cash worth over one million naira for returning N582, 450 to one Mama Ejimeh, a passenger who forgot her money in his commercial tricycle on the 20th of November last year on her way to Jos ECWA Church Headquarters. Although this kind of senario was not the first of its kind in recent time in Nigeria as a cleaner, Mrs Josephine Agwu, some time last year at the Murtala Mohammed Airpot Ikeja Lagos, also returned lost 12m to the owner. But even with that , it is unsual to have a mere poor tricycle driver who has been living from hand to mouth to return huge among of money to the owner considring the fact that even the tricycle he ( Usman) rides was not his own, added to the fact that he pays N2000 to the owner everyday. It is very obvious that Usman had indeed ultimately fought the expected evil temptation that must be telling him at that time to keep the money for himself, especially at this critical time of economic challenges. Eventhough a lot of people appreciated Usman’s gesture, but many also mocked him for exhibing good character of returning the money. Usman’s righteousness and rightness of prefering to continue looking for legitimate wealth had of course eventually paid him off when the Sultan of Sokoto and the National Chiarman of Jama’atu Nasril Islam, Dr. Sa’ad Abubakar upon recieving the impressive story of Usman donated him and his wife, Hajara Dawud , a new brand tricycle, refrigirator, grinding maching and cash of more than one million naira to support him cater for their lives. He might have probably not have thought that something of this reward would come his way so soon. 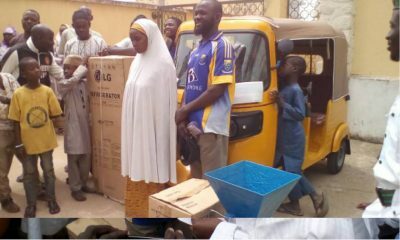 While presenting a brand new Tricycle, a refrigerator, grinding machine at the Jos Central Mosque on Friday last week, to the couple, Dr. Abubakar, however admonished Muslims to continue to uphold the virtues of truthfulness and pursue legitimate means of livelihood like Usman. Usman and his wife were, besides the items, given the sum of N50,000 and N20,000 respectively to get his tricycle registered and for her the 20000 to kick start her business. The Sultan represented by the Emir of Wase and Plateau State Chairman of JNI, Dr. Sambo Haruna, during the presentation of the reward said, “some months ago this young man found huge amount of money left by a passenger in his Keke NAPEP, and he returned this money to the owner, and we felt very happy with what he did, very few in this time can find money and to return it to the owner. We are giving them the reward to show appreciation and to encourage him and others as well. “And we were able to buy KEKE NAPEP for him and a fridge and grinding machine for the wife to at least enable them get a good source of livelihood,” he added. The Emir of Wase futher called on every Plateau man to copy Usman which he said doing this requires God fearing individual like this Usman to do same, encouraging each and everyone to be God fearing and pursue legitimate means of livelihood. Usman while appreciating the gesture in tears said, “ I appreciate Allah, the Sultan of Sokoto, the Emir of Wase and the JNI, for empowering us, may Allah reward all those that have supported us” . Peoples Daily checks show that Usman’s wife Hajara Dawud had played a vital role in the return of the money because according to him, when for the first time he told her about the money, her first response was that she quicly told her husband to return the money to the owner, since the money was not legitimate. According to him, he had to intensify the search for the owner of the money.